Surgical nurse in protective gloves prepares shows and checks up medical clamp and other tools. Surgical doctor put on medical protective mask. Portrait of senior medicine in jalousie background. Portrait of young nurse with syringe. Young short hair medical specialist in protective mask holding a syringe, blurred background. Female surgeon putting on protective gloves. Female doctor wearing protective hat and mask putting on white sterilized surgical gloves on Alpha Channel background. Face of female doctor in surgical cap. Woman doctor in cap and face mask putting on white protective glove close up. 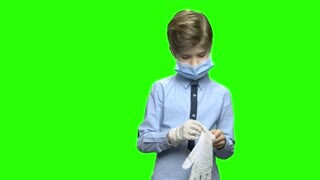 Child little boy puts on medical gloves. Wearing medical protective mask, role game. Green hromakey background for keying. Close up mature doctor puts on medical mask. Close up face of confident male doctor wearing protective mask and surgical gloves. Isolated on white background.